SMELLEZE Natural Dead Animal Odor Removal Granules: 25 lb. Sprinkle in Yard Summary Once that horrible dead animal smell invades your home your mission will be clear: get rid of it - fast! Your best bet is to use a proven deodorizer that is made specially to do this job - Smelleze® Natural Outdoor Dead Animal Odor Removal Granules. Features & Benefits • Quickly removes any dead animal & rodent odor without toxic chemicals or harsh fragrances • E-Z to use! Just sprinkle in problem areas, vacuum or clean after 4-48 hours, and smell is gone! • Use super odor-absorbing eco-friendly powder in the vicinity of dead animal smells or sprinkle directly on carcass • Ideal for deodorizing and absorbing decomposition liquids on any indoor surface application like carpeting, floors, furniture and more! • All-natural, non-toxic and fragrance-free ingredients. Safe for people, pets & planet. • Proudly made in USA Dead Animal Stench Unfortunately, the undesirable animals and pests that invade your home such as rats, mice, squirrels, raccoons, and bats could continue to cause problems even after they die. The stench of dead animals decaying can ruin the comfort of your home and cause mayhem for weeks. Unless, you take immediate action with Smelleze®! 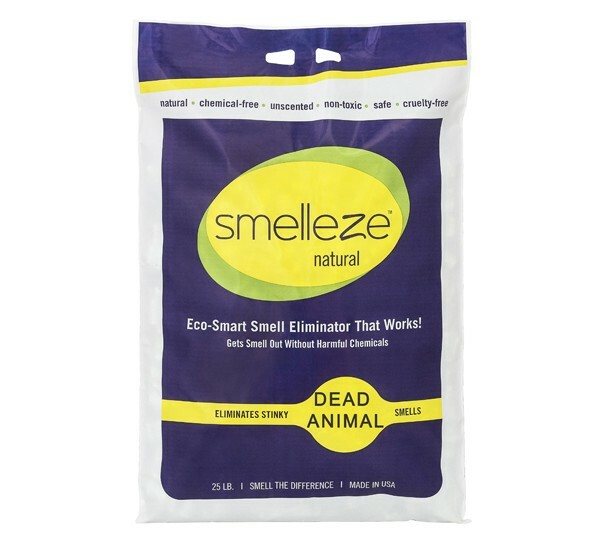 Smelleze® - The Best Solution for Dead Animal Smell on Surfaces Combat offensive dead animal odors in your house with Smelleze® Natural Dead Animal Odor Removal Granules, our non-toxic, fragrance-free all-natural deodorizer that works! Formulated by experts to attack the source of pungent odor, our easy-to-use Granules deodorizer quickly eliminates the nose-numbing stench of any dead animal. As a bonus, it also deters the infestation of flies and insects while preventing mold and mildew. 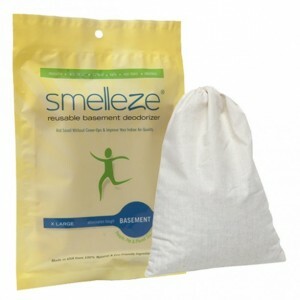 Absorbs Dead Animal Decomposition Liquids & Eliminates Odors Just sprinkle our Smelleze® super odor-absorbing Granules using the handy EZ sprinkle/pour container on any of the following surfaces in the vicinity of the odor: carpets, mattresses, drawers, cabinets, closets, floors, decks, patio, yard, ect. Then simply vacuum or clean-up after 4-48 hours and smell the difference. 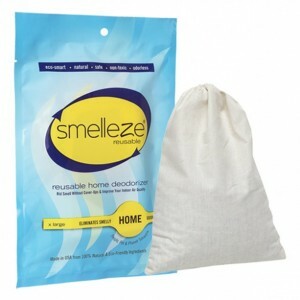 Smelleze® will destroy the vile dead animal smell. If there are any liquids due to the decomposition of a carcass, the super-absorbent powder will quickly absorb that as well. For a one-two punch that stops dead animal odors dead in their tracks, use this absorbent powder on surfaces in conjunction with our popular Smelleze® Reusable Dead Animal Smell Deodorizer Pouches to eliminate airborne contaminants. Get back to enjoying your home and smelling the coffee instead of dead animal stench -- clear the air with Smelleze® -- the marvelous weapon against dead animal stink.